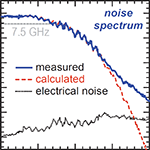 Authors: Williams, C. R. S.; Salevan, J. C.; Li, X.; Roy, R.; Murphy, T. E.
Abstract: We report a 12.5 Gb/s physical random number generator (RNG) that uses high-speed threshold detection of the spectrally-sliced incoherent light produced by a fiber amplifier. The system generates a large-amplitude, easily measured, fluctuating signal with bandwidth that is constrained only by the optical filter and electrical detector used. The underlying physical process (spontaneous emission) is inherently quantum mechanical in origin, and therefore cannot be described deterministically. Unlike competing optical RNG approaches that require photon counting electronics, chaotic laser cavities, or state-of-the-art analog-to-digital converters, the system employs only commonly available telecommunications-grade fiber optic components and can be scaled to higher speeds or multiplexed into parallel channels. The quality of the resulting random bitstream is verified using industry-standard statistical tests.